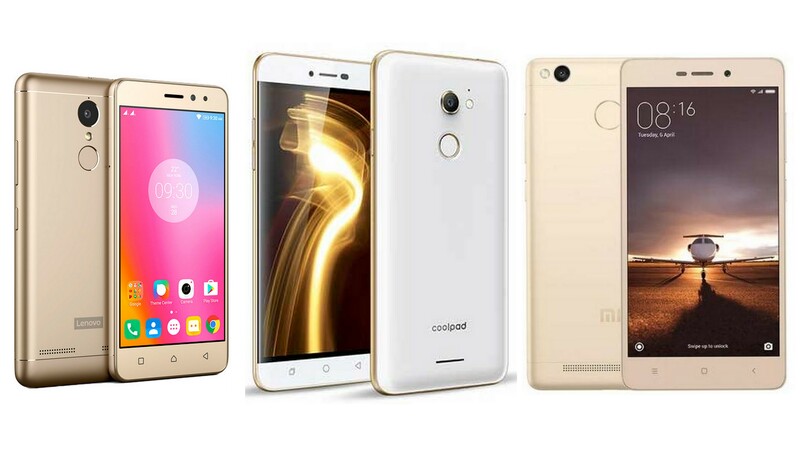 Lenovo K6 Power vs Xiaomi Redmi Note 3 vs Coolpad Note 3S: Which one to buy for Rs. 9,999? Coolpad just finished launching its Note 3S and Mega 3 smartphones in India. The former, priced at Rs. 9,999, aims to compete with the recently unveiled Lenovo K6 Power which too costs the same. Today we compare both Note 3S and the K6 Power with the Xiaomi Redmi Note 3, which is probably the best Android device we can get under Rs. 10,000. For starters, the Lenovo K6 Power comes with a 5 inch full HD display, octa-core Snapdragon 430 processor, dual SIM and 4G VoLTE support. Lastly, the Xiaomi Redmi Note 3 comes with a 5.5 inch full HD display, a much more powerful hexa-core Snapdragon 650 processor, dual SIM and 4G VoLTE support. The Coolpad Note 3S, on the other hand, comes with a 5.5 inch HD display, a slightly less powerful octa-core Snapdragon 415 processor, dual SIM and 4G VoLTE support. The Lenovo K6 Power and Xiaomi Redmi Note 3 sport a metallic unibody build. Both the phones come with curved sides, making them easier to grip. Specifically, the Lenovo K6 Power is very lightweight despite its metallic design. The Redmi Note 3 is considerably hefty at 165 grams, while the K6 Power weighs just 145 grams. On the other hand, the Coolpad Note 3S features a plastic construction. Design-wise, Lenovo, and Xiaomi are quite similar while Coolpad looks a bit different with it curved glossy back. Personally I like the metal construction more than plasticky finish. But it all goes down to personal preferences. A 5-inch Full HD display sits on top of K6 Power. At 1920 x 1080 pixels on a 5 inch display, you get a pixel density of ~441 PPI. This is very good for a phone that costs Rs. 9,999. The Redmi Note 3 comes with a 5.5-inch Full HD IPS LCD display. The pixel density of the phone is ~401 PPI. Coming to the Coolpad Note 3S, you get a 5.5 inch HD IPS LCD display, with 1280 x 720 pixels resolution. The pixel density of the Note 3S is considerably lower than the first two phones at ~267 PPI. The panel quality is good, but it does show some pixelation when closely viewed. The K6 Power sports an octa-core Snapdragon 430 processor. It comes with 3 GB RAM and 32 GB internal storage. The hexa-core Snapdragon 650 processor powers the Redmi Note 3. There are two versions of the device – 2 GB RAM with 16 GB internal storage and 3 GB RAM with 32 GB internal storage. However, you get 2 GB RAM / 16 GB internal storage for Rs. 9,999 – the price that the K6 Power and Note 3S are sold at. Coming to the Note 3S, you get an octa-core Snapdragon 415 processor. The phone comes with 3 GB RAM and 32 GB internal storage. The Lenovo K6 Power and the Coolpad Note 3S run on Android 6.0 Marshmallow, while the Xiaomi Redmi Note 3 is still running on Android 5.1 Lollipop. Lenovo has slightly modified the stock interface, while Xiaomi’s MIUI and Coolpad’s Cool UI completely alter the vanilla Android look. The Xiaomi Redmi Note 3 is clearly the most powerful of the lot. The Snapdragon 650 is way ahead of the other two processors. The K6 Power comes with a 13 MP rear camera, with Phase Detection Autofocus and LED flash. The rear camera comes with a Sony IMX258 sensor while on the front you get an 8 MP Sony IMX219 sensor. The Redmi Note 3 features a 16 MP primary shooter with an f/2.0 aperture, PDAF and dual LED flash. You get a 5 MP camera on the front. Lastly, the Note 3S from Coolpad comes with a 13 MP f/2.2 camera on the back with an LED flash and a front facing 5 MP camera. Xiaomi and Lenovo have packed in large 4000mAh batteries into their devices, while the Coolpad Note 3S features a 2600mAh cell. Clearly, the K6 Power and the Redmi Note 3 have a significant advantage in the battery department. Coolpad doesn’t even come close to its competitors here. Additionally the reverse charging capability of the K6 Power makes it best in the lot. Pricing is the same for all the smartphones. Each of them cost Rs. 9,999. You can purchase the K6 Power exclusively from Flipkart starting from December 6, and the Coolpad Note 3S will soon be available on Amazon.in. However, the Redmi Note 3 is already available for sale on different e-commerce websites. Thus, all of them fare the same in terms of pricing. Regarding availability, you need to wait for the K6 Power or Note 3S while you can purchase the Redmi Note right now. Going through the differences, it is clear that Xiaomi Redmi Note 3 is the most powerful of the lot. The Lenovo K6 Power and Coolpad Note 3S possess similar processing power with the former having a better GPU. If you want good performance, better display and ready to sacrifice a little on the RAM and storage, then you should choose the Redmi Note 3 or else you can opt for the K6 Power. Recommended: Lenovo K6 Power Vs Xiaomi Redmi 3S Prime: Which to Buy and Why?